Natural Christmas decorations add a touch of class to your décor, as well as giving your decorating that down-home feeling. Christmas decorations found in Nature are free, and they are easy to find and use. Most are readily available in the country, right out your back door, while others can be purchased inexpensively. And your country Christmas decorating, using natural Christmas decorations, can be a fun project for the whole family. A project that you look forward to, every year! 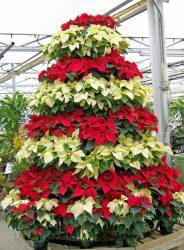 This Christmas tree, an example of natural Christmas decorations, is made from live poinsettias. Poinsettias are a traditional way to decorate. You can find live plants inexpensively at many stores around Christmas, sometimes including Lowes or Home Depot. Poinsettias come in white, red and pink, although the most traditional are the red ones. The colored “flowers” are actually colored leaves, not true flowers. Poinsettias do need some care. They will need to be watered (but not too heavily) and they don’t like to be in a location that has drafts. Churches often decorate with poinsettias, and their beauty adds a touch of class and natural beauty to the alter area. Natural objects like sea shells can be used to decorate. 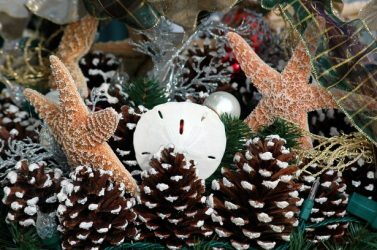 This nautical decor is in Williamsburg, VA, where natural Christmas decorations are commonly used. Natural decor in Williamsburg, VA is typical of Christmas decorating for coastal living. People everywhere tend to use what is available easily. Since Williamsburg is near the Chesapeake Bay and the Atlantic Ocean, the tradition of using ocean objects became popular. In the Mid West, people used wheat and other natural objects that were available to them. What are some of the common things that you see locally? Consider weeds, dried flowers, acorns, nuts and other objects that you see everyday. How can you incorporate these items into your Christmas décor? 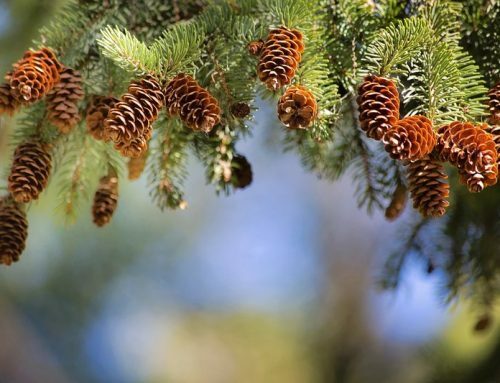 Pine cones are a great addition to natural Christmas decorations, as are holly branches. Pine cones, pine boughs and holly branches with berries are all easy to use in decorating for the holidays. Depending on where you live, these natural objects are often available. In Virginia, pine trees and holly trees grow naturally, in wooded areas. And trimming the trees does not hurt them. In fact, they will grow back bushier and stronger than if just left untrimmed. 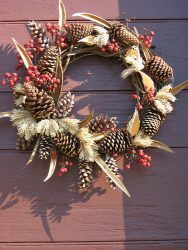 Use pine cones in wreaths, bowls, and as part of swags. You can make garlands from holly or pine boughs by tying the branches together with string or wire. Place holly sprigs here and there, in your Christmas décor. 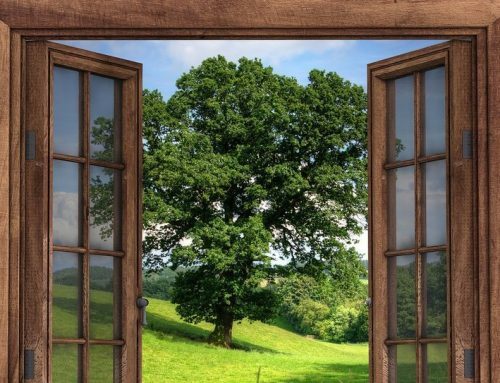 Keep in mind that pine or holly branches indoors may dry out and need to be replaced. If you use them in garlands or wreaths outdoors, they will last for the entire holiday season. Fruit can be used in natural Christmas decorations. Apples add color and interest to a door wreath or centerpiece. Fruit has been used traditionally in holiday décor. Apples were traditional in Virginia, as seen in this Williamsburg, VA wreath. The early Colonists used the fruits of their harvest to celebrate Christmas. But oranges have also been used frequently as natural decorations and gifts. When I was young, we always found oranges in our Christmas stockings. We were told that, during the Great Depression, oranges were scarce and they were a luxury. Oranges were to be treasured as something special, a Christmas treat. In addition, they were valued for their medicinal value, at a time when antibiotics were uncommon. If you use real fruit (as opposed to plastic or wax fruit), your decorations will be short-lived. You’ll have to time the creation of your natural Christmas decorations, to be close to Christmas. This is because you can expect them to start to deteriorate, within a week or two–depending on what you use. Potpourri and spices are traditional at Christmas. They appeal to the sense of smell as well as being attractive. Delicious smells are often part of natural Christmas decorations. 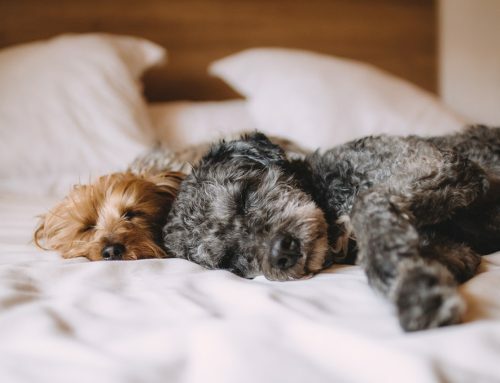 Spices and potpourri, as well as the smell of a turkey roasting or cookies in the oven, all help to make the holiday special. Using nuts in your natural Christmas decorations, is quick and easy. Using nuts is also tradition in natural Christmas decorations. Use nuts that grow near your home, or nuts that your family really enjoys eating. 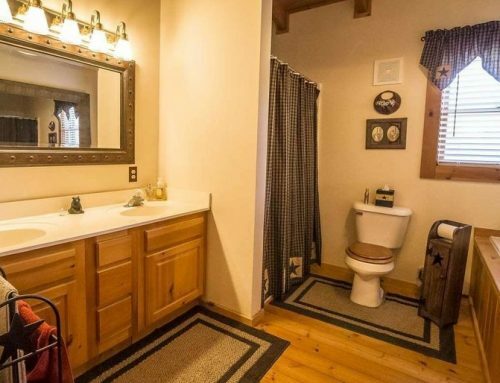 Decorating with natural materials is not new. Our ancestors did not have plastic fruit or silk flowers, and they used what they had—items in Nature. 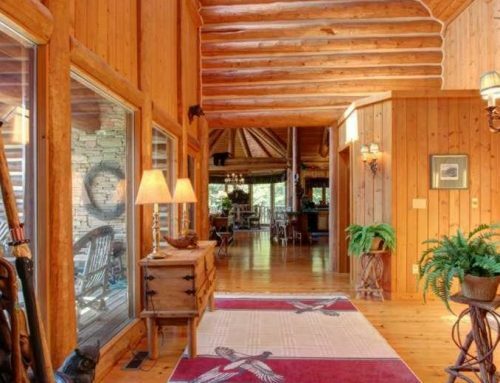 Using natural Christmas decorations in a rustic log home, is a way to bring Nature into your home during the holidays. 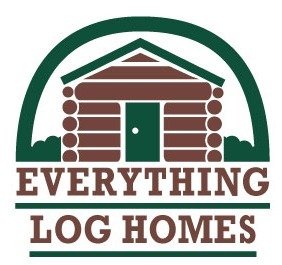 And isn’t that what log and timber frames homes are all about?